CG Says: The 2018 Alfa Romeo Giulia gains newly available Apple CarPlay and Android capability. Forward collision warning is now standard on Quadrifoglio. 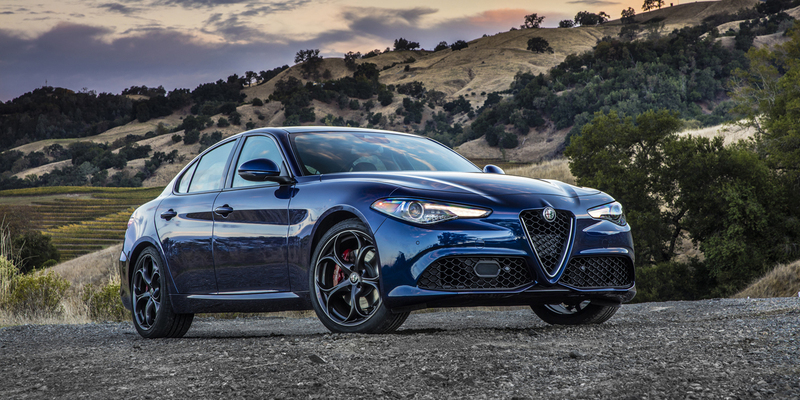 The Alfa Romeo Giulia sedan is a BMW 3-Series challenger, that’s available in high-performance Quadrifoglio trim with a 505-hp turbo V6 or in tamer turbocharged 4-cylinder models. The premium compact sedan has standard rear-wheel drive, but also offers all-wheel drive. Quadrifoglio packs a Ferrari-derived twin-turbo 2.9-liter V6 engine that is paired with a six-speed manual transmission. Alfa Romeo claims a 0-60 time of 3.8 seconds and a top speed of 191 mph. Cylinder deactivation and engine start/stop help fuel economy. The turbo four is a 2.0-liter unit that develops 280 horsepower and is mated to an eight-speed automatic transmission. Available high-performance features include an active-aero front splitter, which adjusts the carbon-fiber front spoiler for optimal aerodynamics and downforce; adaptive damping suspension; a torque vectoring differential that optimizes torque to each wheel separately; Brembo carbon-ceramic brakes; and Alfa DNA Pro drive mode selector, which modifies dynamic behavior among Dynamic, Natural. Advanced Efficiency, and Race settings. Available safety features include forward-collision warning, automatic braking, blind-spot alert, rear cross-traffic alert, and bi-xenon headlamps with adaptive cornering and washers. The Alfa Romeo Giulia brings Italian style and performance into the highly competitive premium compact market.